Thanks for sharing the collection! Wow! Will keep me busy. Nice cover picture. Finally somebody has taken a step to bring hydrocolloids to consumers. I was promoting the idea 25 years ago when at Kelco then Div. of Merck. I agree, lecithin and maltodextrin do not seem to be hydrocolloids. Tim: I’ve listed a number of suppliers at http://khymos.org/suppliers.php, but I’m not able to keep track of all suppliers. I’d suggest you google with “site:uk” + one of the brand names: Sosa, Texturas, texturePro etc. Dennis/Orges: Yes, I commented on lecithin in the introduction. I included maltodextrin since it is a polysaccharide and several recipes call for it. I haven’t used maltodextrin myself yet, so I don’t know much about it’s properties in contact with water. Yes thank you for this as well. I have recently been playing around with these techniques and this wil help a lot. – Agar can be found in most large healthfood stores as a gelatine alternative. Other ingredients not listed in the recipe collection I’ve come across are Arrowroot and Kudzu which both thicken / gel and may be of interest for experimentation. Tim, thanks for the tips! I think I’ll try to incorporate a list like the one you made in a future update. Nice bundle of things-to-do for school holidays.. Thanks a lot! Keep up the great work! Thanks for the thoughtful comment on richcooks.blogspot.com. I was wondering if you’d heard of bois de panama or quillaia. I was perusing the Oxford Companion to Food and stumbled upon it. It has apparently been used to create stable, neutral-tasting foams for ages, and is a widely used food additive. I’ve never been able to find it, even in the New York stores that stock the most obscure spices (Kalyustan’s and Dual Quality Products). Is this stuff used in this hydrocolloidal process ever? having trouble downloading the recipies you so kindly left us. any ideas???? Hi I came across this page while researching. I work at a leading carrageenan manufacturing and export company, not as a sales person though, but thought I could share some useful information here. To those looking for carrageenan products and blends, we offer a wide range of products for various applications. You can visit the website at http://www.rico.com.ph or contact our sales department at sales@rico.com.ph. Ciao! Thank you Martin, this is a great job, both the blog and the recipe collection. 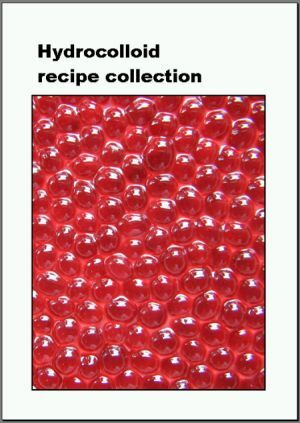 i found this site, surfing the net for molecular gastronomy and related info. I´m a Costa Rican but i live in México, and unfortunetly there´s not that much info in spanish. I starting to experiment with a lot of the things you post in the blog, as a guide. Thank you again for your work time and passion. I want to thank you for having such a fun web site.I am in the 7th grade,and my school is having a science fair,I read the New York Times article on hydrocolloids,its was interesting since alot of the science projects are borring,I was interested in making fruit caviar .My mother bought me the ingredients,she helped me until I learned to make it myself. I made fruit caviar for my science experiment the class loved it ,it was something different. I had to talk about the ingredient,and the chemical reaction,and how some of these ingredients are in some of the every foods we eat.I was selected to go to go to the science fair on April 30 , 2008 .I will write back ,thank you for all the helpfull information. I am in the 7th grade ,I came across a New York Times article on hydrocolloids it was very interesting.My school is having a science on April 30,2008. I did alot of research on hydrocolloids,bought the ingredients and practice making fruit caviar, my mother helped me until learned to make them myself.It was expensive but fun .I made fruit caviar in my science class,the teacher and class mates love it,and I was selected to go to the science fair.I will have to talk about the ingredients,chemical reaction,and how these ingredients are used in the every foods we eat, and use at home. thank you for the help I got from your site.I will write back. Thanks Martin! Wonderfully resourceful!! Hope you find the energy and time to create more. Best!